The upper airway serves as a common conduit of the respiratory, digestive, and phonatory systems. Whereas respiration requires patency of the upper airway throughout the respiratory cycle, swallowing and phonation are dependent on upper airway closure. During swallowing, upper airway muscles close the velopharyngeal sphincter and create a peristaltic-like constriction of the collapsible pharyngeal airway to propel the food bolus into the esophagus. Activation of upper airway muscles during phonation constricts valvelike structures at the velopharynx and glottis. To maintain airway patency during respiration, activation of upper airway muscles during inspiration dilates and stiffens the airway. Loss of upper airway muscle activity during sleep is felt to predispose to pharyngeal airway closure in patients with OSA (Figure 3). Electromyography has been used extensively in research studies to determine the respiratory-related activation of upper airway muscles and their role in the pathogenesis of OSA. In particular, information on time domains, coordination among muscles, and relative amounts of activity (integration) represents the parameters often used (see Electromyography in Section 3 of this Statement). The techniques used to record the electrical activity of upper airway muscles are similar to those described in Electromyography in Section 3 of this Statement. Hooked-wire electrodes can be inserted directly into the muscle of interest. A peroral approach is used to insert the electrode wires into muscles in the oral cavity and soft palate (5-11). A transcuta-neous approach through the cricothyroid membrane is used to insert electrode wires into the cricothyroid and thyroarytenoid muscles (12, 13). A retractable needle catheter advanced through a fiberoptic scope has been used to insert electrodes into upper airway muscles that are not easily accessible througha peroralor transcutaneous approach (14, 15). Given the complex anatomy of upper airway muscles and their relatively small size, it is important to verify the correct placement of the electrodes by having the subject perform voluntary maneuvers associated with activation and/or suppression of the particular muscle. 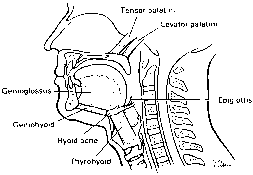 The following maneuvers can be used to confirm correct electrode placement in some specific upper airway muscles: genioglossus, activation during tongue protrusion; pharyngeal constrictors, activation during swallowing; levator palatini, activation on the explosive "p" during phonation of repetitive "pa" sounds; thyroarytenoid, activation during a prolonged "e" sound or Valsalva maneuver; posterior cricoarytenoid, suppression during a prolonged "e" sound or Valsalva maneuver and phasic activation on inspiration. Surface electrodes can be applied on the skin or mucosa overlying the muscle of interest. Surface electrodes can be applied to the skin in the submental area to record genioglossus activity and over the cartilaginous portion of the nose to record alae nasi activity (16, 17). Given the overlapping nature of upper airway muscles and their relatively small size, surface electrodes are likely to record electrical activity from more than one muscle (18). In contrast, intraoral mucosal surface electrode recordings of genioglossus muscle activity are very similar to those obtained from hooked-wire electrodes (19). The electromyogram (EMG) can be analyzed to determine the presence or absence of respiratory-related activity by comparing it with a signal, such as flow or pressure, that indicates the phases of respiration (Figure 3). The moving average signal is used to quantify respiratory-related activity (20). As summarized by Platt and coworkers (20), the EMG ideally reflects global activity in a pool of motor neurons of the muscle. The moving average signal tracks a scaled version of the envelope of the raw EMG signal. This process is called amplitude demodulation. The moving average is readily interpretable as a continuous indication of the total electrical activity of the muscle, and digitization of this slow-output waveform requires much less storage space than the original raw signal. Peak activity is the maximum activity during a respiratory cycle above electrical zero. Tonic activity is the minimum activity during a respiratory cycle above electrical zero. Phasic activity during a respiratory cycle is peak minus tonic activity. Measurements are expressed in arbitrary units, as a percentage of control, or preferably as a percentage of the maximal activity obtained during a particular intervention or during the entire study. The equipment required for EMG recordings of upper airway muscles is similar to that described in EMG Equipment in Section 3 of this Statement. Figure 1. Some muscles that influence the pharyngeal airway. Contraction of muscles attaching to the hyoid bone can displace the anterior pharyngeal wall ventrally, helping to increase airway size. Muscles attached to the soft palate help regulate the route of breathing. cles, and genioglossus activity may not always be representative of motor output to other upper airway or even pharyngeal muscles. For example, during quiet breathing, the pharyngeal constrictors rarely exhibit respiratory-related activity, whereas the posterior cricoarytenoid, a vocal cord abductor, uniformly exhibits phasic inspiratory activity, and the thyroarytenoid, a vocal cord adductor, exhibits phasic expiratory activity (7, 13, 21). Upper airway EMGs are technically difficult given the complex anatomy of these relatively small muscles combined with their often conflicting respiratory and nonrespiratory functions. Electromyography of a specific upper airway muscle does not reveal the mechanical effects of this electrical activation or how the electrical activation of a particular upper airway muscle interacts with the simultaneous electrical activation of other upper airway muscles to influence upper airway function. For example, during quiet breathing in wakefulness, the posterior cricoarytenoid, a vocal cord abductor, is tonically active throughout the respiratory cycle and exhibits phasic activity on inspiration. In contrast, the thyroarytenoid, a vocal cord adductor, is also tonically active throughout the respiratory cycle but exhibits phasic activation on expiration. Electromyography does not reveal the net effect of these simultaneously active counteracting muscles on vocal cord position. This example further emphasizes that electromyography of one specific upper airway muscle is not necessarily representative of others. 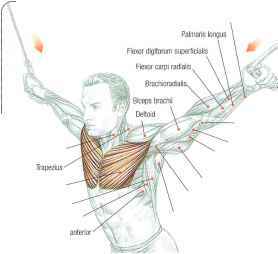 Another general weakness of electromyography is the inability to calibrate the recordings. As a result it is very difficult to compare EMG results from a specific muscle between days or between subjects (22). Some studies have attempted to circumvent this problem by expressing the data as a percentage of maximum activation (10, ll). Such comparisons, however, are problematic. Assuming that filtering and gains are fixed, EMG recording is affected by factors such as electrode site, distance between electrodes, and skin resistance (surface electrode) (22). Figure2. Intrinsic laryngeal muscles attached to the arytenoid cartilage help regulate the size of the glottic aperture. wires. Reproducibility for the wire electrodes was 0.62, and this dropped to 0.22 when the electrodes were reapplied. Jons-son and Komi (28) also found poor reproducibility in the recorded EMG signal among four pairs of wire electrodes implanted in the same brachioradialis muscle. Comparative studies of upper airway function during respiration have frequently used the genioglossus as a representative upper airway muscle (11, 22, 29). However, the genioglos-sus is fixed at only one end, with many degrees of freedom of movement. During protrusions against a balloon transducer to measure force, control of tongue length and orientation cannot be assured. Likewise, it cannot be assumed that the contraction during voluntary maneuvers is isometric or even consistent from trial to trial. The clinical indications for electromyography of upper airway muscles are limited, and in general the technique should be reserved for research studies. Submental surface electrodes are used to record muscle activity as a qualitative signal during polysomnograms to stage sleep. Vocal cord EMG recordings are routinely performed in many centers to assess vocal cord paralysis. By contrast, in general, EMG of the upper airway muscles in research studies is the subject of a more quantitative evaluation and measurement.